Signals: The number of unique proton environments. Integration: The area underneath the curve that corresponds to the ratio of hydrogens. Chemical Shift: The best estimation of functionality based on shielding/ deshielding effects. Splitting Pattern: The number of hydrogen neighbors which follows the N+1 rule unless a more complicated system is present. Above are the relative chemical shifts for particular functional groups in an H-1 NMR spectrum. The more electronegative atoms near a proton, the more downfield or deshielded your signal will be. Unusual functionalities such as ring strain can alter expected chemical shifts. Tetramethylsilane (TMS) is a common reference standard with chemical shift at 0 ppm. Common chemicals shifts for NMR solvents include chloroform (7.26 ppm), methanol (3.34 ppm), acetone (2.17 ppm) and dimethylsulfoxide (2.5 ppm). Other common solvent shifts and impurities can be found here. Splitting patterns gives information about neighboring hydrogens and connectivity. J-couplings can provide additional information about spatial arrangement of hydrogens. This is a value calculated by the distance between 2 multiplicity that is measured in Hz, which is dependent on the strength of the NMR instrument. J-couplings can help differeniate certain protons in the NMR like geminal, cis, and trans hydrogens across an alkene. As seen in the image below, the closer the hydrogens are, the smaller the J-coupling. The further the hydrogens are, the larger the J-coupling is. 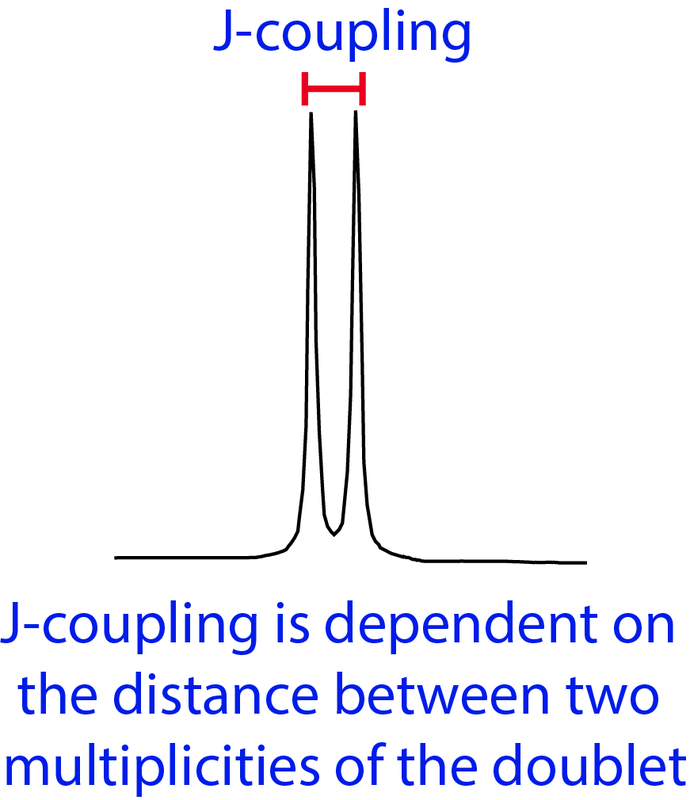 J-couplings are essential in differentiating certain protons across a double bond and can be used to aid in assigning protons in chiral environments.